I use manufactured tiles in my panels. The majority are porcelain and are sourced from France. They are 25mm ( 1 inch) square and are ideal for cutting with wheeled hand cutters. I like precision and often the tiles are cut extremely small especially with the cityscapes. The colours are soft and there is a good range of colours as well as glazed and unglazed versions. Alongside these I also use a variety of glass both in tile form and sheets. I also use millefiori and other miscellaneous bits and pieces which I have collected over the years. 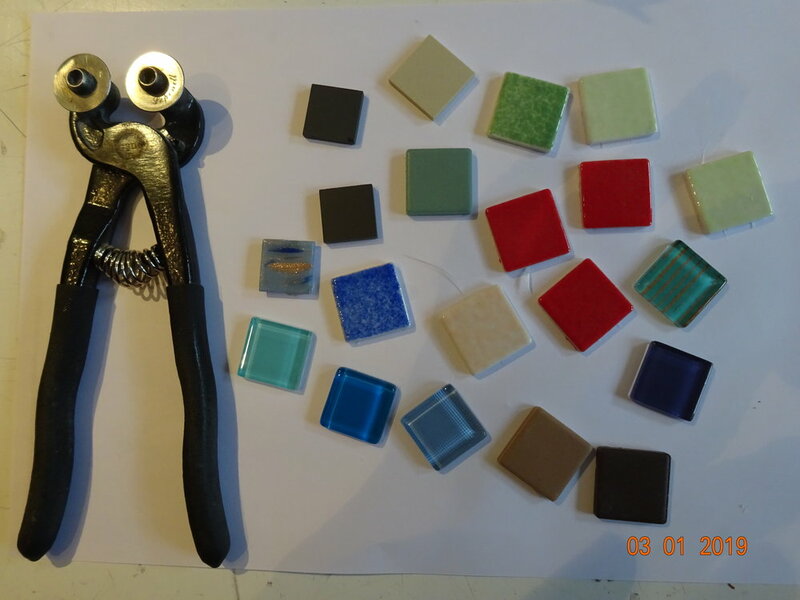 I use wheeled hand cutters to cut the tiles. These are by Leponitt and the wheels can be adjusted easily with Allen keys. Cutting blunts the cutting edges and the wheels need to be adjusted to ensure that the cut is sharp and straight. The base board I use is sign ply wood. This is made from hard wood and is smooth and less likely to warp. The adhesive I use is Weldbond. This is a pva glue but once dry the bond is really strong. The glue also dries clear. I start my work by sketching the panel in great detail. Labelling notes to help with colour. I tend to work a small area at a time cutting a small amount of tiles as required. Where the areas are raised I work with two layers of tiles. For the base layer I use unglazed ceramic tiles and then build with glazed on top for the final layer.